The archival collection explored in this project contains letters written by Edith Bennett, Philena, Hannah, and Sarah Grace Phillips to members of their family between 1850 and 1855. These four sisters, who all attended Oberlin College in the 1850s, were born and raised in Kennett Square, Pennsylvania, the daughters of Dinah Barnard and Mahlon Phillips.1 Theirs was a large family, with ten children in total. The sisters had four brothers, Joseph, John, James M., and Cyrus. Their two other sisters, Deborah and Rebecca, both died before 1850. As abolitionists and members of the Progressive Society of Friends in Pennsylvania, the Phillips family had an activist reputation.2 Their reform upbringing accompanied the sisters to Oberlin, informing their college experiences and enriching the education they received there. Sarah Phillips, also known as Sallie, and her sister, Hannah, were the first of the four to attend Oberlin, enrolling in the Oberlin Preparatory Department from 1852 to 1854. 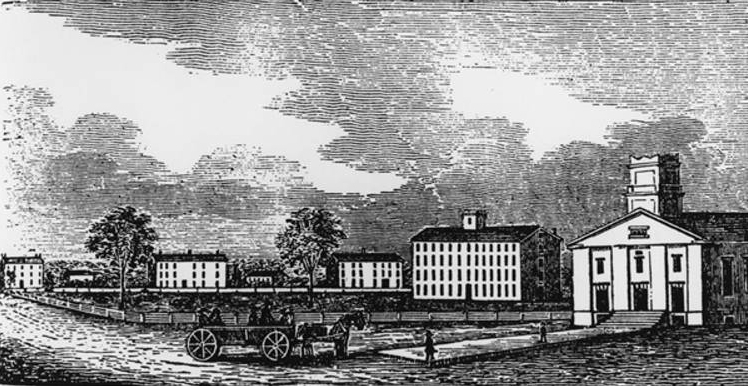 They had previously attended Central College in McGrawville, New York, in 1850, with their older sister Edith, who followed them into the same program at Oberlin in 1853. The Preparatory Course was roughly equivalent to today's high school education. This educational option provided students, who would have found it difficult to complete college entrance requirements from home, with a more accessible path towards higher education in the middle of the nineteenth century. In fact, a majority of the students attending Oberlin were first enrolled in the Preparatory Course. Philena Phillips, the second eldest sister, chose a different route, enrolling in the Ladies Literary Course at Oberlin from 1852 to 1853. This curriculum required fewer advanced courses in ancient languages and mathematics. Philena Phillips later enrolled in the College, from 1853 to 1855. Unfortunately, the sudden onset of tuberculosis prevented her graduation, and, one year after taking medical leave, she died from the illness. Within their letters, the Phillips sisters provide valuable descriptions of student life in Oberlin, including information about the town, housekeeping arrangements, cold weather, the Ladies' Literary Society, and speeches by President Charles Grandison Finney, Henry Ward Beecher, and Antoinette Brown.3 The fact that the four Phillips sisters attended the co-educational college at Oberlin suggests their family's liberal view of women's education, which was uncommon in the 1850s. Additionally, the education of the Phillips sisters reflects views espoused by early feminists, such as Sarah Grimké. In her letters on female education, Grimké advocated for teaching women the ancient languages in order to allow them to form their own opinions on the Bible.4 While such knowledge was rare for women in the nineteenth century, that Philena Phillips wrote home about her Oberlin courses in Greek implies an exceptionally advanced course load for a woman of her time. Despite this move towards increased engagement in social issues, the Phillips sisters nevertheless embraced very traditional views on women and what being a "virtuous" woman meant in the mid-1800s. Similar to Mary Wollstonecraft, who emphasized the importance of modesty and other "virtues" in her Vindication of the Rights of Woman, the sisters judged other women on how closely they matched traditional conceptions of virtue.8 When describing Oberlin's commencement, Edith Phillips focused on the attractiveness of the ladies, comparing them to "snow clouds," "downy birds," and "butterflies," concentrating on their superficial beauty rather than their intellect.9 Philena Phillips' view of women centered less around their outward appearance, but continued to perpetuate traditional ideas of women's role. When praising two girls, she described them as "clever, good, agreeable and quaker like," listing intellect along with more conventional virtues of propriety.10 These traditional views established the sisters as respectable, despite the radical aspects of their education and engagement in social issues. The prominence of religion in the Phillips sisters' college stands out; it was much more prominent in their Oberlin than the Oberlin of today. In the early nineteenth century, Christianity was an essential piece in society's conceptions of femininity, and the sisters modeled their beliefs on this idea. In 1852, for example, Edith Phillips agreed with the biblical view of woman's "duty to be ruled over." 11 In another of her letters, she described an Oberlin production of the biblical story of Absalom.12 Philena Phillips' two letters transcribed in this project focus more on her classes, including one professor's discussion of poetry, yet her response ultimately harkened back to religious devotion. In her reaction, Philena Phillips expressed a belief that one should make "sufficient return" for one's gifts from God, and she criticized the poet Robert Burns for his failure to do so.13 Through frequent references to biblical events and Christian virtues, these letters demonstrate how closely religion informed and influenced the sisters' actions, and the actions of their peers, in mid-nineteenth century American society. The significance of primary sources such as the Phillips sisters' letters in the archiving and understanding of the broader history of Oberlin College cannot be understated. The Phillips sisters' casual discussion of what stood out to them in their everyday lives here provides a unique insight into the kind of experiences and feelings that a relatively progressive female student at Oberlin in the mid-nineteenth century might have had. Most interesting in these documents are the many examples of the impact of gender roles in the sisters' daily lives, including the occasions they objected to the contraints, as well as those that they accepted. This knowledge can be extended to inform our understanding of First Wave American feminism. Sarah Grimké, "Letters on the Equality of the Sexes and the Condition of Woman." Boston, 1838. Philena Phillips to her sister, March 1852. Philips Family Papers. Oberlin College Archives. Mary Wollstonecraft, A Vindication of the Rights of Woman. Originally published 1792, selections chosen by Carol Lasser in August 2010 from the edition created by Electronic Text Center, University of Virginia Library. Edith Phillips to James M. and Mary Pusey Phillips, 27 August 1852, in Phillips Family Papers, Series I, Subseries 1, Letters of Edith Phillips (outgoing), 1847-53, Oberlin College Archives. Philena Phillips to her sister, March 1852, in Phillips Family Papers Series I, Subseries 2, Letters of Philena Phillips (outgoing), 1847-53, Oberlin College Archives. Edith Phillips to James M. and Mary Pusey Phillips, 27 August 1852 in Phillips Family Papers, Series I, Subseries 1, Letters of Edith Phillips (outgoing), 1847-53, Oberlin College Archives. Philena Phillips to Sallie Phillips, 31 January 3 1853, in Phillips Family Papers Series I, Subseries 2, Letters of Philena Phillips (outgoing), 1847-53, Oberlin College Archives.